China is capable of using optical fiber cable (OFC) which would allow 13.5 billion people to simultaneously use phones, marking a new level in China's optical communication systems. The FiberHome Technologies Group, based in Wuhan, Central China's Hubei Province said on Sunday that OFC research has succeeded in transmitting up to 560 terabytes per second (Tb/s), which is capable of supporting 6.75 billion pairs on phones, the Xinhua News Agency reported. The 7-core paths in an optical fiber has reduced the disturbances among paths to the minimum, which means its transmission speed is 7 times faster than that of a single fiber, according to the company. Asia-Pacific further increased its lead in the fourth quarter in terms of the average bandwidth of residential broadband services, as well as the best value for money in terms of cost per megabit, according to Point Topic. The research firm said average bandwidth in the region jumped 28% year-on-year during the quarter to 419Mbps, well ahead of the global average of 118Mbps. Globally, the average monthly cost for residential broadband services declined by $2 to $98. Costs have been decreasing for several quarters. In APAC by comparison, the average monthly cost is roughly $50. The 118Mbps global average bandwidth provided to residential subscribers was up from 112Mbps in the previous quarter, in a result Point Topic attributes to the accelerated rollout of Docsis 3.1 Cable networks capable of 1Gbps speeds. China has set up a 100 billion yuan (US$14.55 billion) fund to support investment in the internet sector, the official news agency Xinhua said on Sunday. The fund, backed by China's cabinet, is designed to help turn China into a major player in internet technology, the report said. An initial 30 billion yuan has already been raised from major banks and telecoms firms including ICBC, China Mobile and China Unicom. Up to 150 billion yuan in credit will be available to companies that have been invested in by the fund, Xinhua said. Huawei has been ranked 40th on the 'Most Valuable Brands' list within the Global 500 ranking of 2017, released by the prestigious 'Brand Finance' platform. Being a research-based forum – 'Brand Finance' specializes in Brand Valuation and the valuation of Intangible Assets. It evaluates the performance of world-leading brands and measures their potential. Huawei Ranked Among the Most Valuable Global Brands by 'Brand Finance'. ZTE warned expected US trade sanctions imposed on the company are likely to hit its financial results, and a settlement could result in a fine. Nokia is taking a bigger step into software with plans for a €347 million ($371 million) cash takeover of OSS specialist Comptel. After Yangtze Optical Fibre and Cable Joint Stock Limited Company (stock code: 06869. 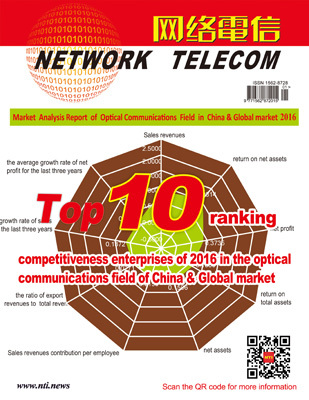 HK, hereinafter referred to as "YOFC") won the bidding in China Mobile's central purchasing of ordinary optical cable in 2016 as the first one (share: 16.77%) in October 2016, another good news came in January 2017 that YOFC won the bidding in China Telecom's centralized purchasing of G.652D optical fiber in 2016, with a share of 16.91%, ranking the second. Corning continues to reap the benefits of North American service providers building out FTTH networks: its optical communications unit sales rose 11% in the fourth quarter. On In August 2016, Good news came from the ITU Telecommunication Standardization Sector "Internet of Things and its Applications in the Smart Cities and Communities" (ITU-T SG20) plenary, to appoint Mr. LiKeng of FiberHome as the SG20 Q6 Associate Rapporteur, followed by which appointing Dr Sang Ziqin of FiberHome as SG20 Vice Chairman. FiberHome has achieved many breakthrough in IOT and Smart City international standard.